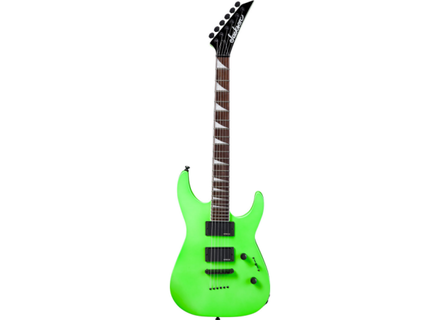 Soloist SLXT, Other Shape Guitar from Jackson in the X series. 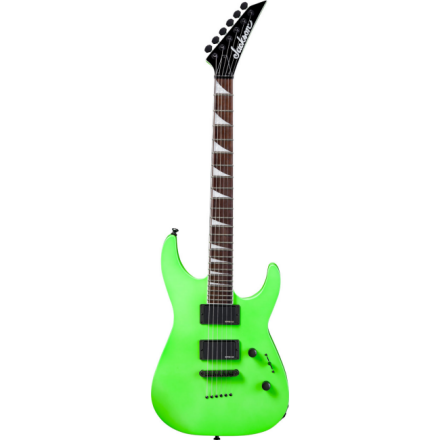 feraledge's review"Shred on a budget"
This is Jackson's new line of wallet friendly guitars. A clear nod to what ESP's LTD and Schecter are doing with moderately priced guitars with some higher end features. That includes a maple neck through the basswood body, Tonepros locking bridge, EMG HZ passive pickups (on this version), and the very quick 12" to 16" compound radius neck that Jackson is known for. These are made in China, but a high quality build. A bonus perk is Jackson's supplier chain transparency clause that rules out sweat shops. Out of the box, mine needed a good bit of adjustment. I gave it a full turn on the truss rod and I've got about 3 dead spot notes on the neck (14-20th frets) that I haven't dealt with yet. The two EMG HZ pickups have a universal volume and tone with a 3 way selector switch. This guitar, like nearly all in the Soloist line is a comfortable super-Strat style shred guitar. It's meant to be played and a lot. It's relatively light and has a really nicely carved heel that gives you really easy access all the way down it's 24 frets. It's really easy to use this guitar through long practices or shows without getting any feeling of flimsiness or shoulder fatigue. I'm not a fan of the passive HZ pickups. I think they do a decent job, but I pretty immediately swapped them out for a set of Seymour Duncan active Blackouts. Those aren't my go to EMG actives, but I decided to do a little different and will probably swap those out pretty immediately. That said, the Blackouts are a little more articulate but bump the lows more into the upper mid range which I'm not a huge fan of. This basswood seems a bit more mid heavy and muddy than the punchier alder that the higher end Soloists use. I think the edgier EMG 81 is a pretty usable fix for this situation and I would have no problem using this guitar live without feeling the need to re-EQ my amp once that pickup is swapped. Obviously that sound preference is a matter of taste, but playing more blackened death metal, my amp is on the scooped side based off of the sound of an 81 in the bridge. I do think the Blackouts in this guitar are a better suit for cleaner styles of playing since that articulation counters the (most-likely cheaper) basswood body. I'm putting the sound at 7 in comparison to the higher end Soloists. If anyone tells you that this cheaper version is just as good, they're either happier with the basswood body or probably don't have an ear for it. I think this guitar looks and feels great, but the sound is where the comparison fails a bit. Totally usable and by all accounts a really solid sounding guitar for the price, but it's all relative. The downside to the X Series is the short cuts. If you can live with the basswood body, you'll be good, everything else is easily changeable. I bought this guitar primarily for it's neck and I have absolutely no regrets there. It's comfortable, easy to play, and really easy to get around. I've played a number of Soloists and I think this is a solid homage to their pricier relatives. For this price range, it's hard to beat. But it has it's downsides. The Jackson branded tuners aren't great. I swapped them out immediately for locking Sperzel tuners. The 3-way switch, pots, and input jack, from my experience aren't great on the X Series. With a bit of play you could quickly see their quality drop and get some crackling that you wouldn't want to hear on a relatively new guitar. The good part is that those are fairly easy and cheap fixes, in fact, most new pickup sets come with higher quality parts, which is what I ended up using. In my opinion, the upsides of a maple neck through, excellent neck, fine looking guitar and upgraded Tonepros locking bridge, more than compensate. If you're just getting started, you should feel fortunate that a guitar like this is available in this price range. If you're looking for a touring, back up or whatever guitar, just know that you're better off doing some quick modifications and you'll still be ahead of the curve for the quality.